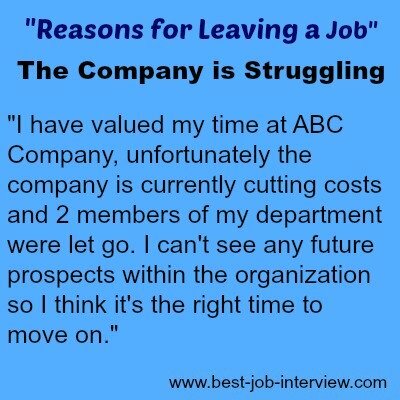 There are a number of rational and acceptable reasons for leaving a job. When you get asked this question "Why are you leaving your job?" 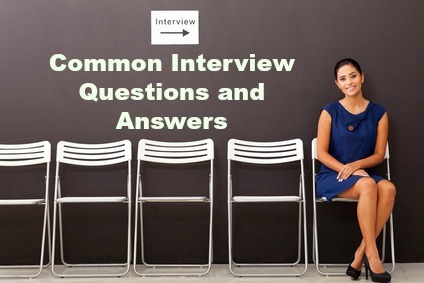 in your job interview it is essential to answer confidently - a solid explanation helps you to do this. Your potential employer wants to clearly understand why you are moving on, a legitimate reason will set their minds at rest. Every employer is looking for loyal and responsible employees. It is critical that your explanation for leaving reflects the right work values. Spend some time thinking about why you want to leave your job and list your reasons in order of importance. This will enable you to present an insightful and sound explanation to any prospective employer. This is a common and valid reason for making a move and usually includes a more senior position, increased responsibilities and more challenging tasks. You can point out how you have mastered your current position and now seek fresh challenges which your current company is not able to provide. It is important to be specific about what this new job opportunity offers you in terms of new challenges and growth. You have re-evaluated your career goals and decided a change was needed. Goals change as you gain experience and grow in your job and the company may not be in a position to meet your new career needs. Or you may be leaving your job to move into a new industry or a completely different career. Be sure to highlight how the job opportunity is a good fit with your career goals and how your skills can be successfully transferred to this job. Is your company going through restructuring or changes such as a merger? In giving your reasons for leaving a job you can focus on the impact these changes have had on your position, your career plans and your ability to produce the high standard of work you are accustomed to. Jobs change or you may land up doing something very different from what you were hired to do. This can be frustrating if it has resulted in your not using the skills and competencies you were hired for, or doing work that you are not interested in. Avoid sounding negative or playing the victim. Focus on why your skills will be of more value to your new employer. This is a rational reason for leaving your job. However it is necessary to provide proof such as unpaid salaries, no increases, lay-offs, no new resources. Where there is little hope that a company will improve profitability it is logical to try and find employment elsewhere. Try to avoid sweeping descriptions such as "failing" or "bankrupt" and rather use specifics. There are times that people have to leave a job in order to take care of family situations. In your interview answer it is important to reassure the interviewer that these circumstances have now changed sufficiently for you to be able to focus again on your career. An overly long commute is an acceptable reason for seeking employment closer to home. Life-work balance is recognized as essential to employee productivity and health, however it is advisable to combine this with another reason. "I am looking for a position that is closer to my home and that provides the opportunity to fully utilize my sales skills"
Blaming your manager or co-workers is always a bad explanation. Bad-mouthing your boss or colleagues or discussing office politics casts you in a negative light. This is both wishy-washy and raises red flags about your commitment. Rather focus on why the job is not a good fit for you in terms of your skills and abilities as discussed above. You may have felt you deserved the promotion but the potential employer does not have the objective evidence required to determine that. Reasons such as long hours and overtime are to be avoided. Companies want to employ hard-working and dedicated individuals. This may be the case but again the potential employer has no evidence to fairly determine if the demands on you were too much. Stay clear of complaints about your workload or tough expectations. Employers are well aware that one of the top reasons people leave their jobs is for more pay. A recent survey from Paychex found that almost 70% of people quit their jobs for a better salary. The question is how to explain this as a reason for leaving your job. Everyone has financial needs and goals and if your current job or company simply cannot ever meet them it is logical that you want to move to a job where you can reasonably attain the level of salary you seek. Try to combine this reason for leaving with another so that you don't come across as only focused on the money. You should be able to adequately explain all the career transitions on your resume. Be prepared to explain your reason for leaving each job.